If you prefer taking a bath, but don't want chlorine or chloramines in your bath water, use Vitabath Vitamin C tablets to remove the chlorine and chloramines from your bath water. Effervescent vitamin C dechlorination tablets are comprised of ascorbic acid, citric acid and sodium bicarbonate. This powerful formula is designed to neutralize chlorine and chloramines in a hot tub or spa. 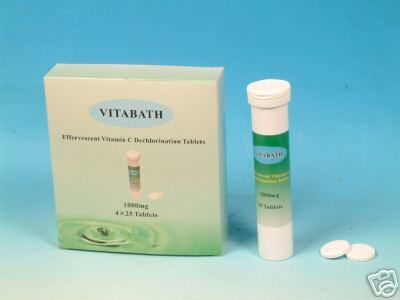 As Vitabath dissolves, the vitamin C will become effervescent and begin to fizz. Dechlorination agent: 100% Pharmaceutical Grade Vitamin C.
Totally remove chlorine and chloramines from your hot tub and spas. Relief from dry, itchy skin. Meets the dechlorination requirements of the US EPAs Clean Water Act. Contains a nutrient which is essential for the health. Suggested Use: One tablet fully neutralizes 1 ppm chlorine and chloramines in 100 gallons of water. Preferably one tablet per bath. 100 tablets per box. Store at room temperature. Avoid excessive heat and moisture.